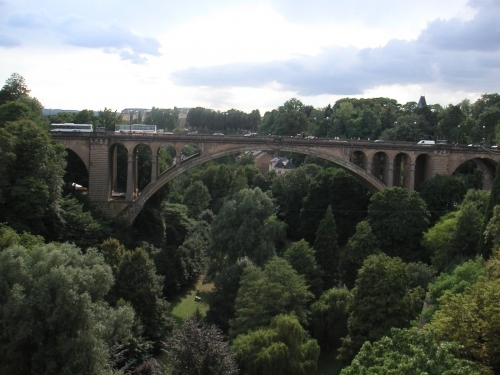 The bridge Pont Adolphe in Luxembourg is a major construction designed by the French engineer P. Sejourne and built from 1899 throughout 1903. The bridge is made of two masonry arches with a span of 84.6 m on the central. At the time of the construction the bridge held the world’s largest arch span for a masonry struction. To day the bridge is still one of the world’s most prominet masonry construction. In 1961 the bridge underwent some important refurbishement works with the aim of enlarging transversally the upper deck. Over the time cracks opened along the neutral axis of the main arches. In order to prevent significant damaging of the bridge, perpendicular post-tensioning cables were installed. Thereafter the bridge was equipped with SOFO sensors in order to monitor effectiveness of the strengthening (main reason for crack occurring) and to understand the real behavior of the bridge over the long term. 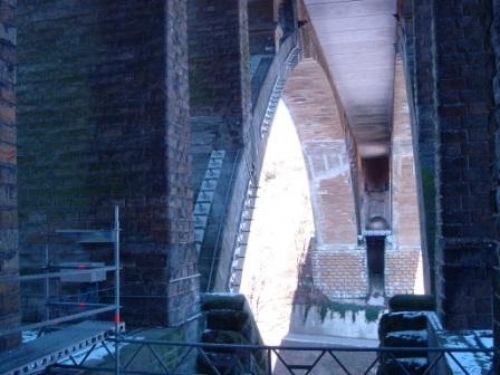 Dynamic tests were also performed on this bridge, and SOFO sensors were monitored with the SOFO Dynamic Reading Unit. The resulting measurments showed that no bending and no shear strain anomalies were noticed. Also no relative rotations and no shear sliding between the blocks were detected. Only small average elongation changes were noticed, which seemed to be correlated to temperature variations due to day-night temperature fluctations. During the analyzed period the structural behavior of the monitored area of the bridge is estimated to be correct and without anomalies. Dynamic tests results are not available.